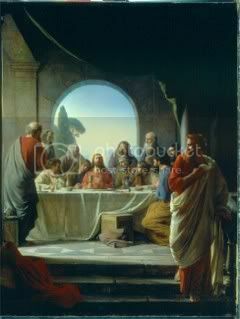 This day, three days prior to the Resurrection, is the day that Christ washed the feet of his disciples and shared his last meal with them, known as The Last Supper, a spartan course upon which he said: "Take, eat; this is my body. Drink of it, all of you; for this is my blood of covenant, which is poured out for many for the forgiveness of sins." Thus establishing the Eucharist and Communion for all Christians thereafter who reenact that Last Supper. In cathedral churches it is the custom for the bishop, to re-enact the footwashing in a special ceremony following the Divine Liturgy. On this day in greek orthodox doctrine we paint the eggs which are traditionally red like the poppies of the field which were supposedly spilled with Christ’s blood, hence they became red (they were formerly white, or so the tale goes). The dyes used are mixed in vinegar which is also reminiscent of the vinegar proffered to Jesus on the cross by the roman soldier who made fun of him when he asked for water. Everything is symbolic, it seems. Egg is often regarded as a symbol of birth and fertility in many cultures or of the cosmos. As it contains life and food to feed it as well, it is a potent means of reminding us of the resurgence of spring and the reproduction of flora and fauna around us. It is even viewed as a symbol of the soul, which was aptly exploited in Alan Parker's 1987 film Angel Heart in which Rober de Niro as the devil himself, devours a whole egg with alarming cool recounting this exact belief. In medieval Europe, eggs were forbidden during Lent, so it was a prized treat for children on Easter and indeed that is why eggs are offered to children today, even if they take the form of chocolate ones. Eggs were also painted bright colors (red is the traditional one like mentioned) to resemble springtime and the new life it offers. For that last reason lovers often exchanged eggs, similar to Valentine's Day cards today. In ancient Europe, eggs of different colours were taken from nests of various birds as they were prized in the making of talismans. The eggs were often ritually eaten too. The search through the forests for eggs gradually evolved into the habit of the Easter egg hunt, and painted eggs eventually replaced wild birds' eggs. You can read more on the decorated easter egg and its history here and here. When we sit on the table after Saturday’s midnight service we clink each other’s red egg and he who manages to get his/hers unscathed is proclaimed winner. It’s as if they have preserved the valuable life and they’re now free to consume it and gain strength by it. An endearing tradition…. Maundy Thursday is also the day before crucifixion, when Jesus went to pray alone to gain strength before his ordeal and so it is somber, meditative and melancholy to me. For that reason I picked up incense scents that seem centered, a bit sparse in their character and that could instill an introspective mood of spirituality. Encens et Lavande by Serge Lutens: The introspection of incense coupled with the clean, sparse atmosphere of lavender. The latter is making a quick and medicinal appearance upon hitting the skin, a clean, nose-decongesting aroma that is usually not what I enjoy and quite different than the lavender of Gris Clair which begins on an antithetical course. There is also the hint of sage, a herbal smell that could be very well remind one of that land where Jesus prayed in the cool air of the night. Incense is light in this fragrance and it takes a somber, smoky, whispery, slightly orientalistic take thanks to light amber that is left on the skin for some time while lavender has evaporated. As if you’re inhaling the aroma of a cloth that has been smoked in the white smoke of an outside burning chalice. I find this an excellent perfume for meditation and it calls upon all calm and collected thoughts. Bois d’encens by Armani Prive: If we are to forgive mr.Armani for his trespasses discussed yesterday, like we expect to be forgiven for ours, it is thanks to this little gem in his Private collection, bottled into an architectural modern Kotibe wood column of a bottle, topped with a dark red “pebble” . A clean smoky incense that wafts from the forests on the cool wintery air is the impression this makes. In the spirit of Avignon, yet lighter, not as thick and with less staying power which is an utter shame for the hundreds of bucks this goes for, it is easily wearable by anyone who is willing to take a plunge n the mysterious world of incense and does not make difference between the sexes either. The background of lots of cedars smelled from a distance is enough to make one appreciate the austere nature of such a perfume. Encens Mystic by Crazy Libellule and the Poppies: This relatively new and refreshingly inexpensive French brand is rippling the waters with their fun, cute, completely adorable little solid perfume sticks like lippies that come in many different permutations, collected into three lines: Shanghaijava (with oriental and woody scents), Les Divines Alcoves (with scents of musk and flowers) and Poule de Luxe (comprising scents of unapologetically gourmand tendencies). From their Shanghaijava line Encens Mystic is truly exceptional and really smells more expensive than the mere amount asked (11 pounds on hqhair.com). Being a solid it has the tendency to wear closely to the body and with good tenacity, encompassing notes of Myrrh, Frankincense, Benzoin, Patchouli , clove, a hint of vanilla and Cedar. The result is a rich, pungent incense fragrance that smells like the Incense Series by Comme des Garcons or close to Black Cashmere by Donna Karan. The wax smell is simply non apparent which is a plus for a solid and the pungency of the notes makes a brilliant juxtaposition with floaty clothes and smooth hair. I find it mystical, like its name suggests and quite poised and a delightful surprise to come out of a new house with no credentials of grandeur. For so few bucks a pop it shouldn’t really pose a doubt as to whether it’s worth purchasing. Just do it. Next intalment talks about deep and solemn incense.